So behold…my first buffalo chicken recipe on the site. And actually, after tasting these little guys, I’m pretty sure it won’t be my last. 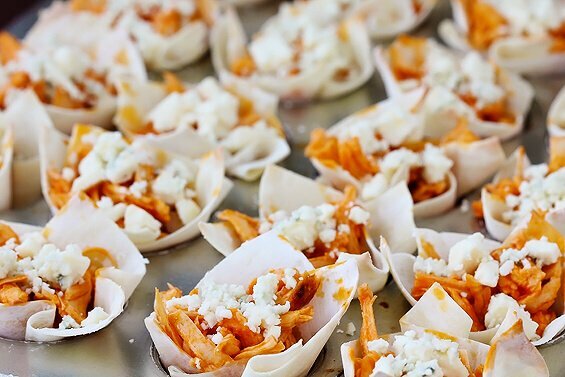 These crispy little wonton cups are simply filled with buffalo chicken, topped with some blue cheese and green onions. Easy peasy, and super addictive. I actually recommend making a double batch, because these will disappear at your party pronto. 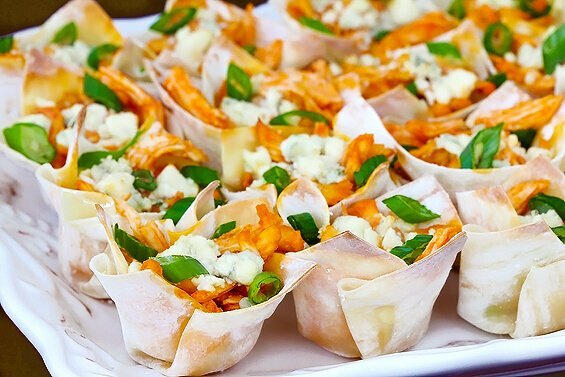 You’ll love this Buffalo Chicken Cups recipe. It’s simple to prepare, and serves as a brilliant appetizer for special occasions — and perfect for game day! Brush chicken breasts with olive oil, and then sprinkle evenly with the smoked paprika and chili powder. Place in a baking dish and cook for 20-30 minutes, or until the center is no longer pink and the juices run clear. Remove chicken and let cool, then shred. Meanwhile, fit a wonton wrapper into each of 24 mini baking cups, pressing the wrappers carefully but firmly into sides of cups. (Be careful to keep the corners of each wonton wrapper open; otherwise you will not be able to fill them!) Bake for 5 minutes or until very lightly browned. Keep wontons in baking cups. 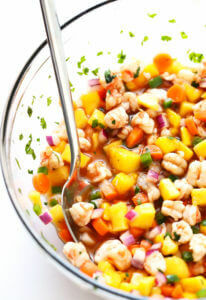 In a medium-sized bowl, stir together the melted butter and hot sauce. Add the chicken and stir until well coated. 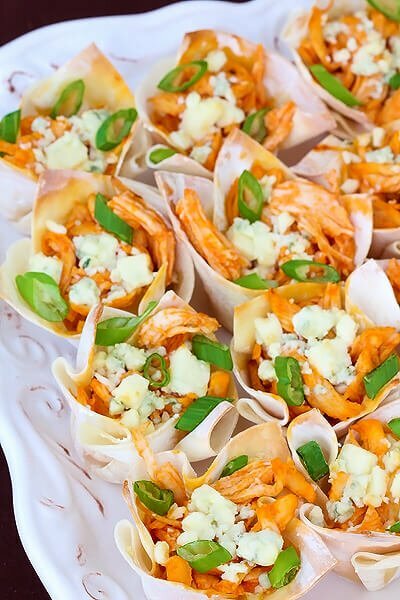 Then fill each wonton cup with a tablespoon or two of chicken, and then top with a pinch of blue cheese. Return wonton cups to oven and cook for another 5-10 minutes, or until cheese is soft and melty. Remove and top with sliced scallions, and serve warm. These are best served immediately. If you’d like to save a step, you can easily substitute a rotisserie chicken for this recipe. Just shred it, and follow the steps to mix it with the hot sauce, etc. Paul and I are HUGE Frank’s fans. We eat a buffalo-inspired meal probably weekly. I love this idea, I’m sure he will too! Uhhhh, done and done and done and done and done. 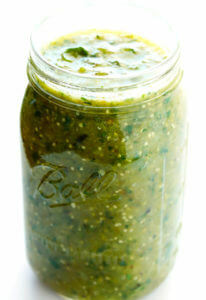 incredible recipe–i know this is going to be a huge hit, i can’t wait to give it a try! Mmmm now I want to make apple nachos… I do have a good jerk chicken nacho recipe… and these look amazing. I can’t stand wings but I do love the flavor so I am definitely going to try these!! Buffalo chicken dip is also amazing and really easy. The recipe I use is straight from the Frank’s bottle and consists of 1 package cream cheese softened and spread in a corningware or pie plate, cover with shredded chicken mixed with Frank’s hot sauce. Cover with blue cheese dressing, sprinkle with cheese and throw it in the oven until melty. It is heavenly with celery chunk or pita chips (sturdy chips are better for this because it is really thick dip). It disappears at every occasion. I would love to know what the apple nacho recipe is! Hiya, sorry to ask this here but I really love your theme, would it hapepn to be a free one i can download somewhere, or is it a custom theme you had made? Soon i will be launching my own blog, however i’m not great with designs but i do like the style of your site so it would be excellent if i could find (or buy) something with a similar look as my last designer cannot finish my site. Thanks! This looks yummy and fun! I’m not a blue cheese fan-has anyone tried a different cheese? YUM! We baked the wonton wrappers like that and filled them with taco meat, cheese, etc. 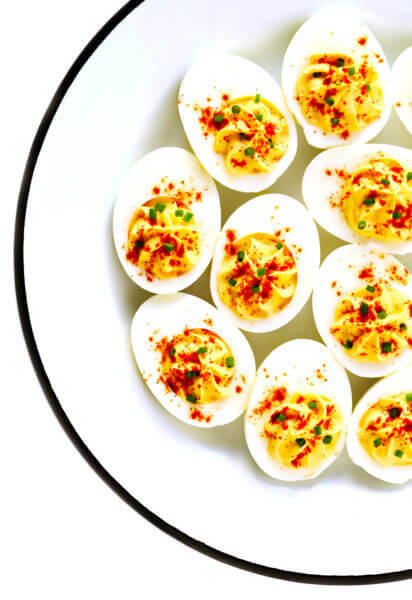 I love the idea of filling them with buffalo chicken! Buffalo chicken is easy to do in crock pot too. Pack of ranch dressing powder mix and bottle of buffalo sauce. Leave cooking on low about 5-6 hours. I have even put the chicken in frozen. Then add butter and shredd in crock pot. Cook another 30 minutes. Made these today. Fabulous. A little too spicy for wife….may increase butter and lower the Franks for next time. I could only eat 7 of these for lunch…will try reheat later and report on it. I tried them later with the pre-made phyllo shells and a thin layer of cream cheese – a little easier and still delicious! Wow those look marvelous. I got here from a Pinterest pin that my friend @cyngagen posted. Love these. They will be the appetizers for girls-night-out cocktail night! Your creation is SOOOOOOO beautiful. I usually fill my wonton cup with salsa. Your idea is so creative. It’s the perfect appetizer for football/hockey nights! These look delicious!! Any idea how they’d be served cold? Have a reunion to go to but it’s an hour away and outdoors so I can’t take hot food… Thoughts? I’ll just call them Chicken Cups…. I’m in Buffalo, so everyone knows they’ll have Buffalo Tom’s Hot Sauce on them!